Yejin Choi is an Assistant Professor in the Department of Computer Science & Engineering at the University of Washington. She completed her Ph.D. in Computer Science at Cornell University and her B.S. in Computer Science and Engineering at Seoul National University. Yejin's area of research is Natural Language Processing (NLP), focusing on contextual and nonliteral aspects of language understanding. Through the analysis of writing style, her recent work builds statistical models that can detect deceptive online reviews and predict a novel's success. Her research has been featured in numerous media outlets such as New York Times, WNBC News, IEEE Spectrum Podcast, NPR, and CBS Radio. 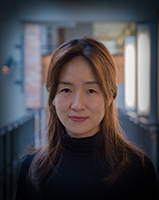 In addition, leading research efforts that combine NLP with computer vision, Yejin studied data-driven approaches to automatically captioning photographs, and designed statistical techniques to infer the natural conceptualization of object names in the world. Her contribution in this area was recognized by the 2013 David Marr Prize.